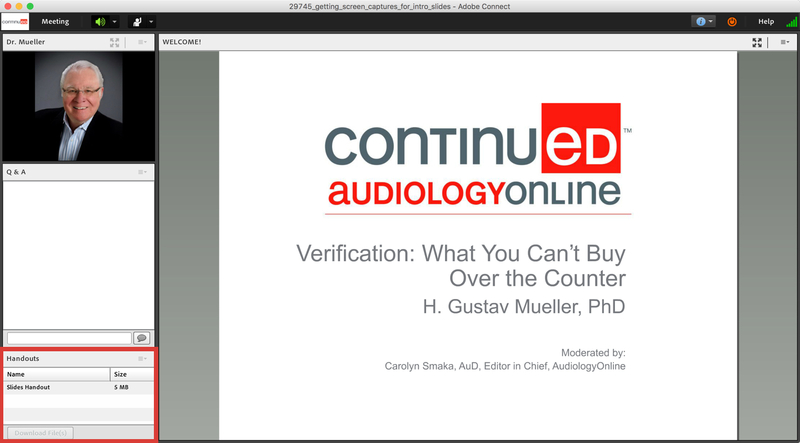 What is an AudiologyOnline live webinar? What if I am not available during the live webinar? Can I earn CEUs/Hours for a live webinar course? How do I register for a live webinar? What do I need to participate in a live webinar course? Can I take a test drive to check my system? How do I login to a live webinar course? During the a live webinar course how do I download copies of the handouts? During the live webinar course how do I ask the presenter questions? Do I need a microphone? How do I earn CEUs/Hours for participating in a live webinar course? AudiologyOnline live webinars are the profession's premier internet-based educational seminar series. The most compelling part of a live webinar is you can participate from almost anywhere! Using our simple to use e-learning platform, all that is required is access to a computer (PC or Mac) with a web browser (i.e. Chrome, Internet Explorer, Firefox), Flash Player 10 or higher and high-speed internet access. Also, mobile device access is supported with the Adobe Connect App available for free in the App Store or Google Play. The live format allows participants to interact with the "Expert" via question and answer sessions, and presentation of timely information in an efficient and inexpensive way. What if I am not available during the live webinar course? All live webinars are recorded and archived on AudiologyOnline. The recorded webinar course will be made available within 2-3 business days following the live webinar. Simply visit us at www.audiologyonline.com, click on the "Continuing Education" link, select the "Recorded Webinar Courses" option, locate the recorded course, and follow the instructions to register for the course. So if you miss a live webinar, you can simply view the recorded version of the course instead. Can I earn CEUs/Hours for an live webinar? YES! You will need to check the course listing on AudiologyOnline for the CE details of a specific webinar. Once a live webinar has ended you will be required to take a short multiple choice exam to earn your CEUs. Simply login to your CEU Total Access Subscription to access your exam under 'Pending Courses'. You must complete this exam within 7 days of the live webinar to earn CEUs/Hours. Please see our CE Processing Help for more information. How do I register for a live webinar course? Simply visit us at www.audiologyonline.com and login to your account. Click on the "Continuing Education" link, and select the "Live Webinar Courses." When you are ready to register for your course, simply select the 'Register Now' button. What do I need to participate in a live webinar courses? Speakers and/or headphones connected to your computer to listen to the presentation. To ensure your computer is prepared, perform an eLearning test drive. If you experience connectivity issues, pleases close all other windows/programs, and utilize a hard-wired connection. If your issues persist, it is recommended you try another web browser. Using a mobile device? Please note you must install the free Adobe Connect App on your mobile device. The app is available from the Apple Store or Google Play. The Live Webinar Test Drive is a series of diagnostic tests to insure your computer is prepared for a live webinar. Click here to view the Test Drive information page. NOTE: If you are unable to complete the series of diagnostic tests, please contact us immediately at 800-753-2160 so that we can assist you with set up. We recommend that you login to a live webinar course 20 minutes ahead of the scheduled start time in case there are any login issues with your computer. Please make sure you have all needed software/hardware installed on your computer as listed above. During login if you are prompted to install the Adobe Connect Meeting Application, please do so. When you registered for the live webinar you were sent an email that contained an invitation link. Click on the invitation link in your email and you will be automatically logged into the webinar. Once you are logged in the Event Moderator will instruct you on how to interact within the course. Login to your AudiologyOnline user account and navigate to your Dashboard. Your live webinars are listed on the right, along with a button labeled "Attend Now;" click the "Attend Now" button up to 30 minutes before the scheduled start time of the webinar to enter the online classroom. During the live webinar, how do I download copies of the handouts? If handouts are available, they can be downloaded during the live webinar from the "File Share" pod. To download a handout, click on the title of the handout and then click the "Save to my Computer" icon. A new browser window will open with a "Click to download link." Click the link and save the file to your computer. NOTE: Pop-up blockers may prohibit the browser window from opening; disable your pop-up blocker if you cannot download the file. Use the File Share pod to download handouts. It is at the discretion of the Presenter if there will be any handouts for a given course, therefore, not all live webinar courses will have handouts that can be downloaded and printed out. Download files are typically in PDF format. Click here to download and install Adobe Reader (free). You may download the Handouts from the File Share Pod at any time during the live webinar. During the live webinar, how do I ask the presenter questions? Do I need a microphone? To ask a question of the presenter, simply type your question in the Chat (Q&A) pod. Type your message in the bottom white bar of the pod and click the carriage return icon to send your message. A microphone is not required to participate in an ESS live webinar. You may ask questions using the described Chat method. How do I earn CEUs/Hours for participating in a live webinar? If a course is offered for CEUs/Hours, once a live webinar has ended you will be required to take a short multiple choice exam to earn your CEUs/Hours and complete the process. Simply login to your CEU Total Access Subscription to access your exam under 'Pending Courses'. You must complete this exam within 7 days of the live webinar to earn CEUs/Hours. Please see our CEU Processing Help for more information. Please note that for live webinars you must complete your CE exam within 7 days of the event or you will not be able to earn CEUs/Hours. Here are the most common steps you can take if you are having trouble logging into a live webinar or if you experience any difficulty during the webinar. Step 1: Make note of any error message that you have seen. This will be important if you need to call us for technical support. Step 3: Enter the live webinar by logging into your AudiologyOnline CEU account. Find the live webinar listed on the right. NOTE: This link will only allow you to login to the live webinar during the scheduled time of the live webinar. If you are logged into your webinar and experience audio problems, please make sure that your speakers/headphones are connected to your computer securely, turned on with the volume at mid level, and that they are not muted. If you have gone through all of these steps and continue to experience problems, please contact us at 800-753-2160, or send a note to the moderator using the Chat (Q&A) Pod and we will help you directly. AudiologyOnline is committed to providing equal opportunities in accordance with all applicable laws. If you are in need of a disability-related accommodation, please contact customerservice@audiologyonline.com We will review your request and respond in a timely manner. Please note that we will require a minimum of 2 weeks to provide a reasonable accommodation for your request.